You finally did it – your grass is cut, your flowerbeds are planted and mulched, you’ve trimmed the hedges and cleaned out the fish pond. You overcame torrential downpours and scorching sun. Literal tons of organic fertilizer, natural hardwood mulch, and environmentally friendly pest deterrents combine to create your perfect oasis. And now, your yard is a wonder full of beauty and natural grace, painstakingly created through hours and hours of hard labor and sweat. And then they appear – slowly at first, and then all at once. Weeds. You look on in horror as these ugly monsters rip through the carefully maintained dirt of your once-perfect lawn, speckling your emerald field with their hideous faces. And for a moment, you consider grabbing the Roundup – or the flamethrower. But then you remember the promise you made yourself – nature should be natural. So how do you get rid of those yard invaders without resorting to chemicals? Let’s take a look. When it comes to weed removal – especially from the lawn (as opposed to flowerbeds) – the number one resource you have is right under your feet: more grass. Maintaining your lawn properly isn’t just about keeping everything well-trimmed; rather, it’s about following smart techniques to support healthy growth of the foliage you want (and to deter the plants you don’t). For starters, make sure that your mower isn’t standing between you and a great lawn. Sharpening your mower blade ensures a clean cut across your entire lawn, which prevents the blades of grass from getting ragged and brown (and ultimately dying). Also, mowing is stressful for your lawn – especially when you do it in the hottest part of the day. Mowing at dawn or dusk is the best for your grass, since it will limit the combined strain of the trim and the sun. 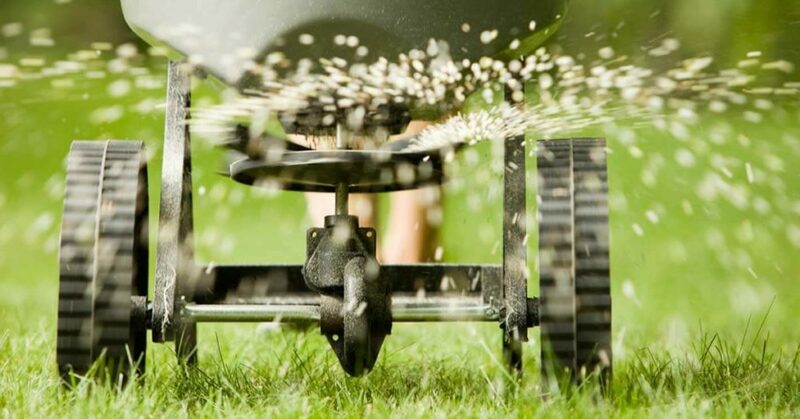 Another way to thicken things up is by strategically adding high quality grass seed and garden lime to your lawn – a process known as overseeding. Especially when done in the mid- to late-fall (once the need to mow regularly has wound down), overseeding can produce a robust, luscious bed of new grass, filling in bare spots and crowding out the undesireables. In long stretches between substantial rain, it’s common to water your lawn to support the continued health of your grass. But when watering, it’s important to make sure that you’re not just giving a quick once-over several times a week. Shallow, frequent water leads to grass with short roots – leaving room for weeds to move in. Instead, water less frequently but with more thoroughness. Giving your lawn a nice, deep soaking about once a week will go much farther in the long run. Not sure how to measure? Take an empty tin of tuna or cat food and put it along the edge of the lawn. Once that tin is full, the lawn has likely taken in about an inch of water – the ideal amount to help most types of grass thrive. When it comes to crowding your lawn with thick, healthy grass to avoid the invasion of annoying weeds, most of your success will be in preventing new weed systems from forming. But strong, persistent weeds may need a little more incentive to hit the road – and that’s when it’s time to start picking. Pulling weeds doesn’t have to be a painstaking process, but it’s important to make sure you do it correctly. Simply tearing the leaves off the stem won’t do the job – those roots are solid and will just grow back. Instead, the challenge is to get the weeds out by the roots and then immediately seed over the bare patches that are left behind, encouraging new grass to settle in before another weed can make its home there. This entry was posted on Tuesday, August 22nd, 2017	at 1:56 pm	. Both comments and pings are currently closed.